It’s been such an incredibly long time since I last took outfit photos; I thought to myself as I was in the park today, that it must be about six weeks since I last did this. I’m pleased to be back to regular posting now after the crazy busyness that was my life this year. When I look back I can’t quite believe I got married, moved house and finished my law degree all within a month. It was incredibly exhausting and stressful. Remind me never to take on this much at once ever again! Anyway, this is the outfit I wore on Christmas Day. I had to dress up in it again today for photos since I had no chances on Tuesday due to the rain. I always use Christmas as the ultimate excuse to dress up despite the fact that Christmas is usually a small and casual affair and I am extremely overdressed in comparison to everyone else. I always put a huge amount of thought and effort into choosing my Christmas outfit; as a bonus I realised later that it was a Christmas colour too! As I said the other day the rain made it feel very unlike Christmas. I’m just so used to warm and sunny Christmas days in Sydney. I started off the day in a pair of black heels to match the dress but within a short period of time I changed into the yellow shoes. My sister gave them to me for Christmas and I wanted to wear them immediately despite yellow and green not being a colour combination I would have chosen normally. I’m absolutely obsessed with my new shoes. It was such a thoughtful idea because they are my very own version of a pair of shoes which I’ve borrowed from my sister continually this year. I’ve been desperate to have a pair myself and it is so exciting. My pair are even more comfortable, have gold trim on the inside and are a brighter shade of yellow. WOW! My sister’s version of these shoes I wore here. This entry was posted in Outfits, Review Australia. Bookmark the permalink. LOVE, LOVE, LOVE your Christmas Day look! Those pumps, that dress, and your hair look so perfect. hiya dear! gorgeous dress,you have a nice style! Aw you look so pretty in your green dress! I'm absolutely in love with your shoes too. They're flashy and fun and look great with your dress. fantastic dress! 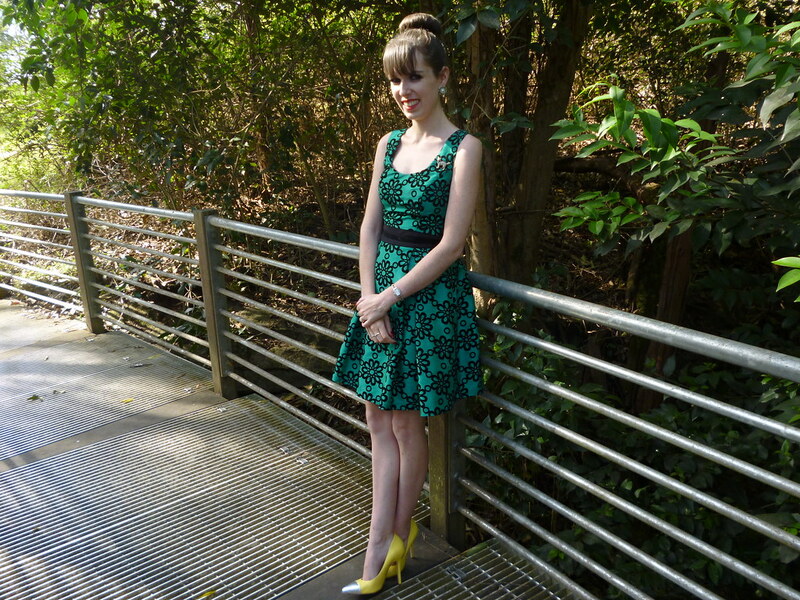 I also like the shoes you paired the dress with, yellow and green go well together. I'm a fan of lively colours and these lively shades make you really shine. That's such a perfect Christmas look. I love the green dress, and those shoes look so stunning. You look stunning with that dress! What a perfect Xmas look!! Your blog is awesome. I follow you now, and you can follow my blog, if you want. Beautiful look! I love everything about it, perfection! Hi sweetie, that is the loveliest dress in such a festive shade…you look beautiful in it! Beautiful dress and shoes (your sister is very generous). It sounds like you have had a busy year! I like your blog and am now following. Please feel free to follow me back if you like my blog. really cute dress and i love your heels! Love the dress, shoes and your hairdo! Welcome back to outfit pictures!! Getting married sounds like it can take a lot of time. 😉 Congrats, though! You look so lovely. I adore the print and cut of that dress and your heels are such a lovely pop of yellow. Lovely outfit! Congrats on your wedding! Wishing you a very happy new year! That dress is so gorgeous! Perfect for a warm Christmas day! Congrats on your wedding as well; the pictures were so beautiful! That dress is adorable and I love the hair bow too! Very beautiful and lady like! Love the hairdo too. I love your dress both in style and in colour, the shoes, your hair, and your entire look. You look wonderful (though a bit on the slim side). It's amazing that you gat so much done and made it through such a blizzard of important events in your life so brilliantly. It's nice seeing your outfit post. I hadn't been blogging myself until very early this morning, the 1st of January 2013. Best of luck with this exciting new part of your life – I hope it all goes swimmingly. I enjoyed your wedding photos and love your Christmas outfit. Have a very Happy New Year!